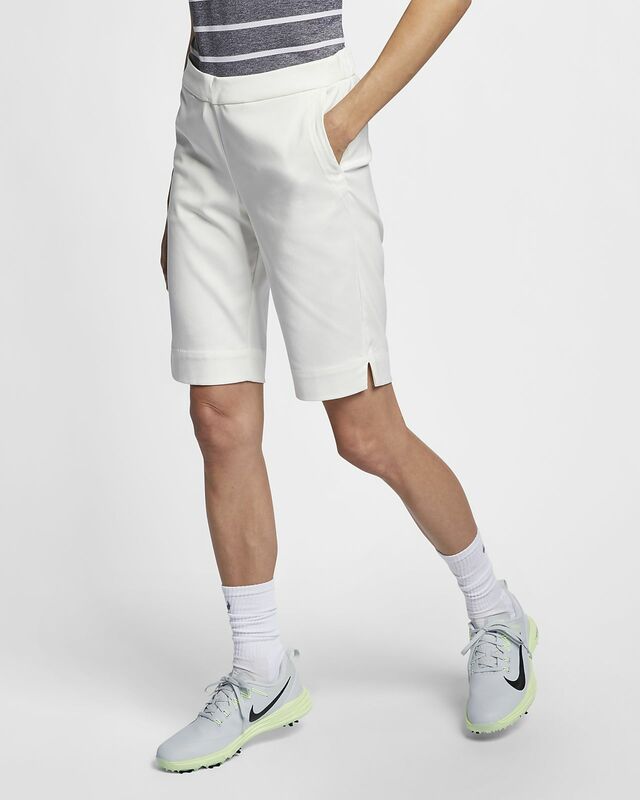 From the course to the clubhouse, the Nike Dri-FIT UV Shorts offer stretchy, sweat-wicking comfort and a hem that allows you to adjust the length for a more tailored look. An overwhelming request from athletes led to the creation of this pull-on design. Pull-on silhouette offers easy on and off. Soft woven fabric with spandex moves with you. Blind hem lets you convert the shorts between an 11" inseam and a 10" inseam when worn with a 1" cuff. Alpha sizing helps simplify fit options. Fabric: Body: 96% polyester/4% spandex. Pocket bags: 100% recycled polyester. This product provides UVA and UVB protection from the sun in the areas covered by the garment. Any closures must be fastened to give full UPF 40+ protection. It will not protect areas that are exposed. To protect these areas, the use of good quality sunscreen is recommended. Pockets are mesh try to get a tee out of that. No zipper, only drawstring. Seems more of a hiking short than golf.